"When I first tried cooking prime rib, I was nervous; it cost a lot of money, and I didn't want to ruin it. Well it turns out prime rib is easy but it is essential that you have a good thermometer. You probably spent $30+ on the meat. Save your investment and spend another $25 on a good thermometer with a probe and an alarm if you don't have one already. By following the rule about the temperature, you can scale this recipe. Cut the bones off the bottom of the roast and serve separately or save for another time. 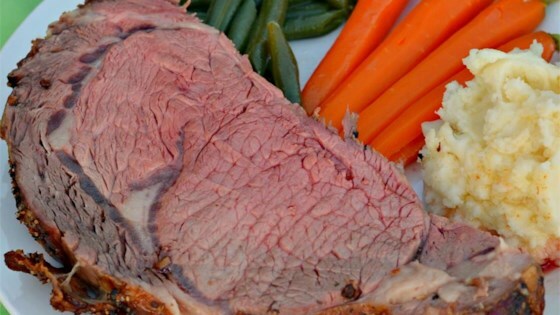 Slice the roast and serve with creamy horseradish, if desired." Place roast, bone side down, in a roasting pan. Mix olive oil, steak seasoning, garlic, Italian seasoning, and mustard powder together in a small bowl; spread over the roast. Allow roast to come to room temperature, about 45 minutes. Bake roast in the preheated oven for 20 minutes. Insert a meat thermometer in the thickest part of the roast away from the bone. Reduce oven temperature to 325 degrees F (165 degrees C). Continue to cook in the oven to your desired degree of doneness, or an internal temperature of 145 degrees F (65 degrees C) for medium, about 1 1/2 to 2 hours. Remove from the oven, cover with a doubled sheet of aluminum foil, and allow to rest in a warm area 10 to 15 minutes before slicing. The most important part is to get good meat. Nothing belongs on Prime Rib other that a wee bit of salt and maybe a mite of pepper. Everything else obscures the taste of the meat. Excellent instructions and the result was perfect! Instructions were great... my roast came out perfectly. Thank you!